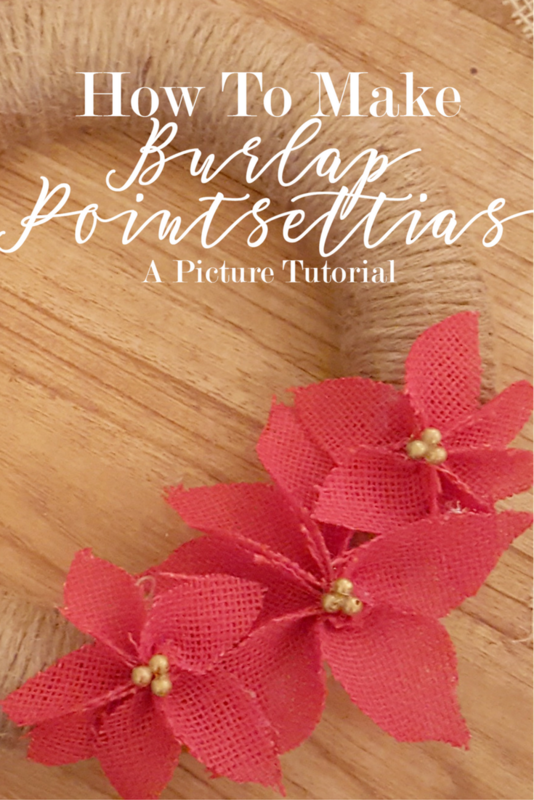 I don't know about you, but I think that Pointsettias at Christmas is a staple and if you're looking to add a little rustic charm to your Christmas decor this year, you have to check out this tutorial. I got the idea to make burlap Pointsettia flowers when I had a bunch of red burlap left over from some recent projects. This picture tutorial will lay out the steps you need to follow to make some pretty ones for yourself. 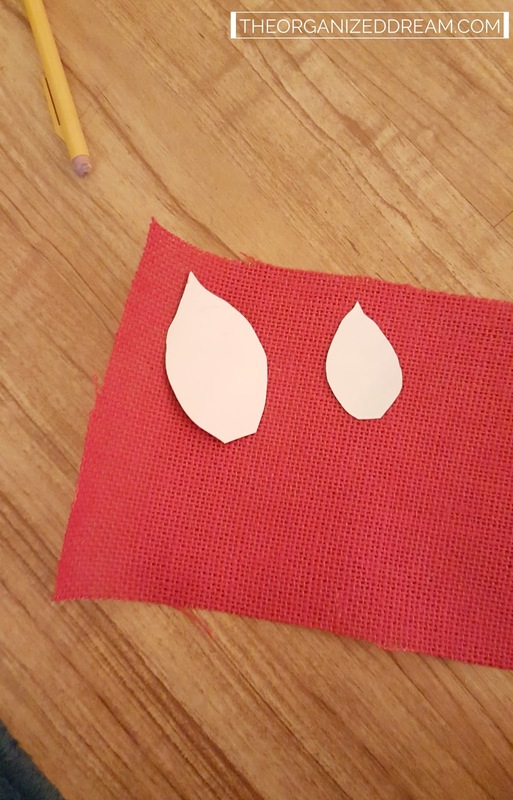 I created my own template by crudely sketching petals. I wasn't going for a particular shape. I made two sizes for the project that I was going to make. I made one end flat and the other pointed. 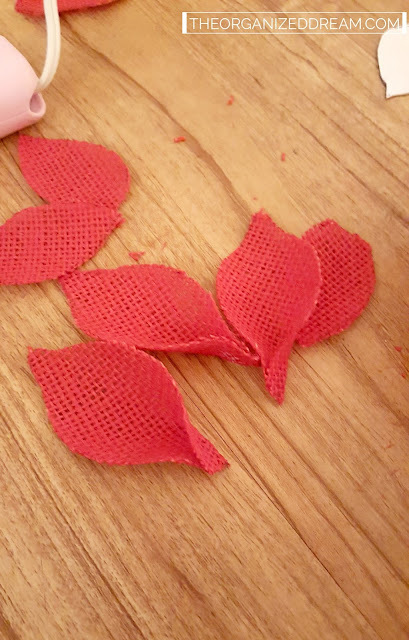 Then cut out six petals per flower. 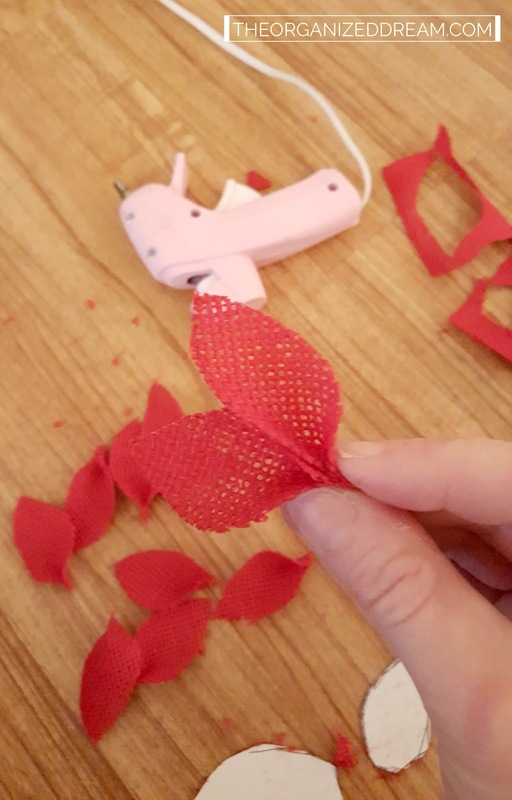 Use your glue gun to pinch the flat end of your petal together. Don't burn yourself! Glue all six petals together to create a fan. 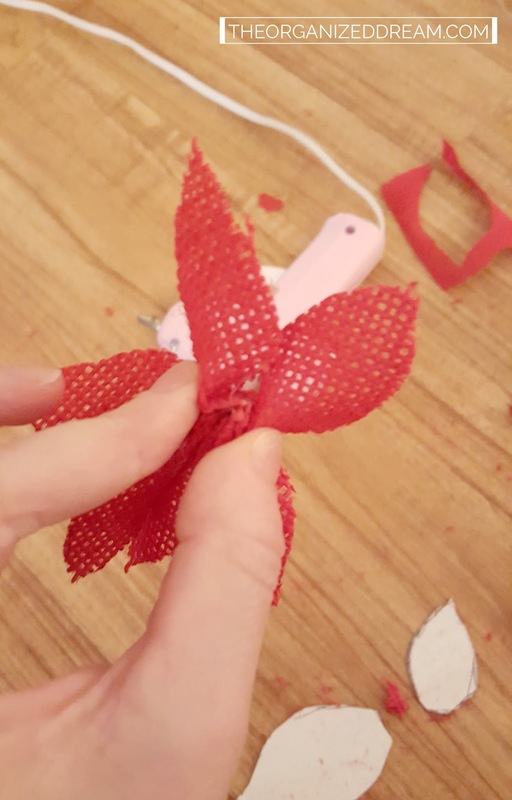 Take the two end petals and glue them together to form the final shape of the flower. This may take some finessing and you may have to pull the petals apart a little bit. 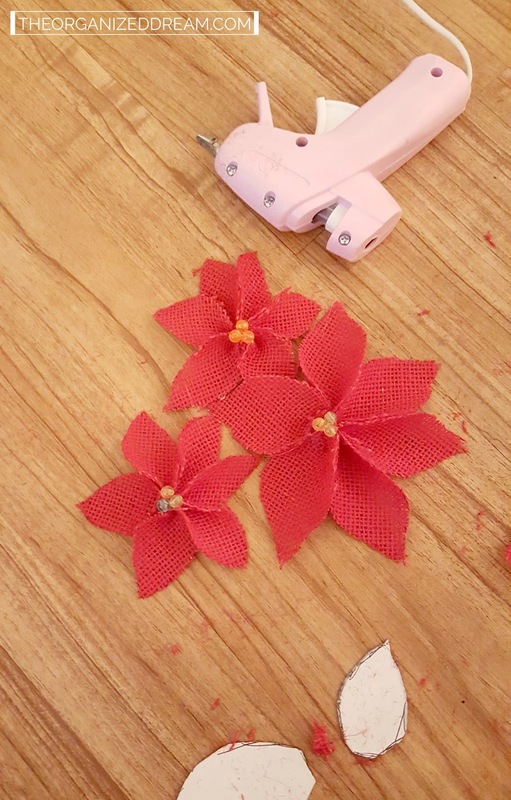 Take three beads and glue them to the middle of each flower. These will be your berries. Paint your beads using a fine-tip brush and some gold paint. It may take a couple of coats. Let dry between. 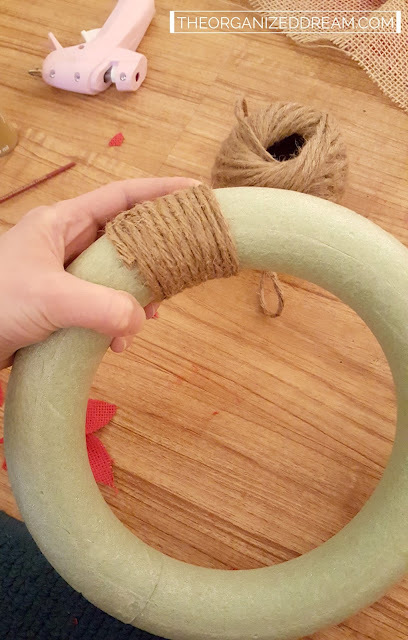 I wrapped jute around a foam wreath form and glued it into place. 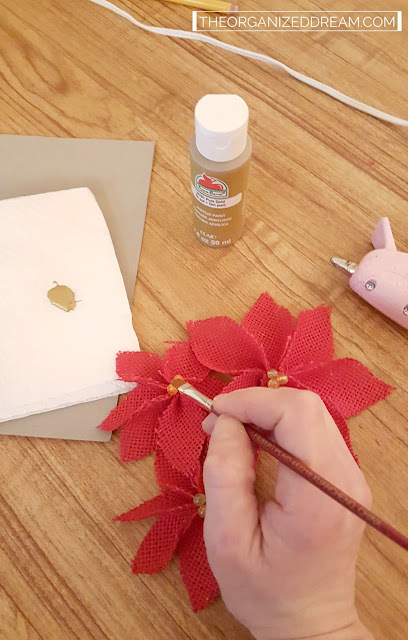 Glue your oh-so-pretty flowers to your wreath form with a little bit of glue. Creating these Pointsettia flowers is fun and easy when you get the hang of it. If I had the time, it would have been nice to make a wreath entirely out of these, but that's for another project! 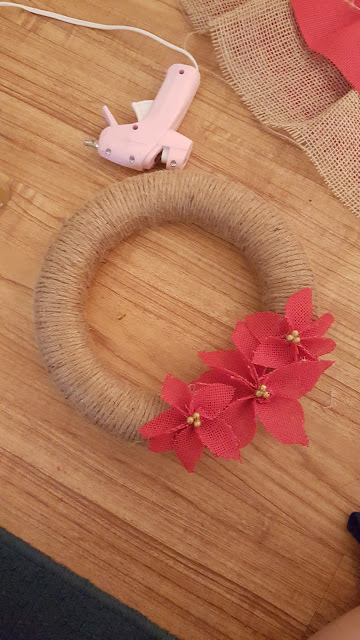 I decided to hang this wreath above my DIY Christmas Stocking Holder and love the way it adds a bit of color. I love these. They are so pretty and I like the idea of making them from burlap. Very nice.